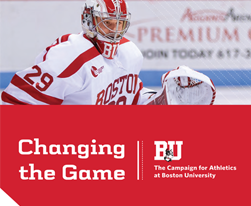 The Friends of Field Hockey is a group dedicated to providing fundraising and volunteer opportunities to engage former student-athletes, parents, alumni, and fans to benefit the Boston University Field Hockey program. There is nothing better than knowing that your teammates have your back on and off the field. BU has a rich tradition with so many wildly successful teams, and I love that we are a part of that energy. Give today to support the student-athletes, facilities, staff, and programs that make Boston University Field Hockey great.